This was one of those investigations that reminds me of how awesome it is to be a member of Maine Ghost Hunters. On this particular investigation day, I have to tell ya, “I’m lovin’ life”. We left Maine somewhere around 8:00 in the morning and made a leisurely commute to the great state of Massachusetts where the much-rumored-about “8th gate to hell” resides. 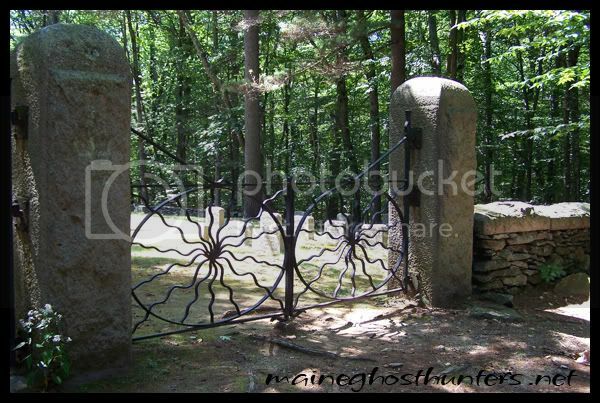 Tucked in the back woods of a somewhat remote area, surrounded by brush, trees, and fields of farmland lay the prize; Spider Gates Cemetery. Spider Gates Cemetery is one of those graveyards who’s reputation precedes it. It’s sad, really, when I think about it, because at the root of all the stories lay the relative of someone who’s ears these rumors may meet. It’s my perception that people forget that they’re talking about someone’s mother, father, brother, uncle, cousin, or otherwise, when they tell these stories of evil that take place within cemeteries such as Spider Gates. 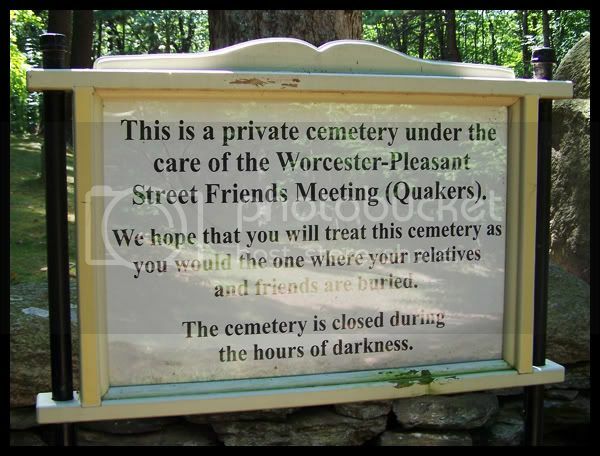 I’ll tell ya, when made the trip to the Friend’s Meetinghouse Cemetery in Leicester, Massachusetts I was wholly preparing myself for a downright menacing experience. I had heard of ooze emerging from the ground, apparitions of small children, a “hanging tree” which sometimes reveals the reason it bares the name, satanic rituals and cults, and the manifestations those satanic rituals produce. What I found when we finally arrived at the entrance to Spider Gates Cemetery was a beautiful, serene atmosphere who’s grounds are impeccably neat, clean, and obviously cared for by people who are wholly vested in honoring those interred persons at rest here. I can’t tell you how wonderful the area looked and felt. It was simply breathtaking. It makes me want to give a scowling look of disapproval to people who pass such awful rumors about this location. The grounds are absolutely stunning. 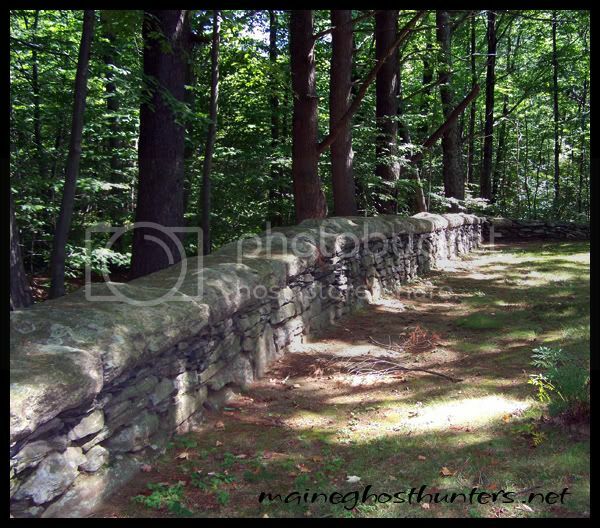 The stone wall that encompasses the outer perimeter of the cemetery has been neatly hand made by stacking rock upon rock, stone upon stone, and each one appears to be laid in place and held there by gravity and the weight of those stones above. There is no cement holding this wall together. It is meticulously maintained and rarely did we observe a stone out of place. The headstones aren’t nearly as ornate as those stones in Puritan based cemeteries I’ve written about in the past, but they do depict a burial period that transcends the past couple of centuries. The rumor that this burial ground is no longer used is a flat out lie. We observed that a person was buried here as recently as this past year, 2008. The headstones themselves may be simple, lacking much more than simple epitaphs, names, and dates of birth and death, but their simplicity exudes a certain level of beauty that is entirely communal. It’s as though the message you receive in this place is that these people lived as a community and they rest in peace, for eternity, as a community. We have been to a few cemeteries in the past, and none have felt as warm and inviting as Spider Gates. We were able to take a walk around the grounds and check out the different rumored sites of interest. For instance, the “altar” location in the center of the cemetery. It is said that Satanic Rituals may be performed here on a regular basis by visiting Satanists, which is why the area appears to be cordoned off in some purposeful way. That “purposeful way” , according to rumor, is supposedly designed by the Satanists. The more historically accurate version of this “altar” area is that it’s almost certainly the footprint of the original Friends Meeting House foundation. I was overtaken with the sheer beauty of the trees that grace the center of this beautiful cemetery and was somewhat affronted by the notion that anyone could consider this place to be any level of “evil”. We ventured toward one of the back walls of the cemetery where we noticed some upright- standing granite blocks averaging a height of roughly 3 to 4 feet tall. TonyL thought this area could have been considered the “altar” area, or an “altar” area as well, but we were at a loss for an ultimate conclusion as for what this was more likely used for. We took notes of “the hanging tree”, and the “note” we took was that the limb used for the hanging is quite a distance off the ground. The breadth of the tree would make it very unlikely that anyone who hung themselves from it “shimmied” their way to the limb. Basically speaking, you’d have to really, really, want to hang yourself from this particular tree in order to get the job done, because the effort you’d have to go through to actually do it, is quite an involved process. I’m not saying a young boy didn’t hang himself from this tree, I’m just saying he had to be exceptionally tall, incredibly talented at climbing the, virtually, un-climbable – or both. We didn’t see any apparitions of ghostly children while visiting Spider Gates, but we did hear sounds that sounded like eerie children for a brief second. Turned out to be high pitched birding vocals. I’ll admit, it took me by surprise for a brief second, but once the sounds were identified as birds, and were repeated often throughout the rest of our time on the Quaker grounds, all was fine. 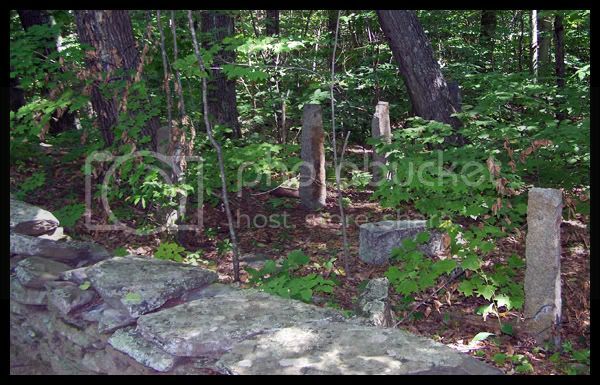 The apparitions we had read about that appear in this area were basically a little girl, a little boy, and a slightly pre-teen or early teen boy. There’s an awful story, that dates a few decades back, of a 6 year old boy from a nearby boy’s home that was beaten to death by one of the older teen-boy’s from the home. His body was dragged through the woods and stuffed into a culvert. The story is heartbreaking and the location of the culvert, which we found, intensified the grisly nature of the crime, start to finish. The culvert was so small in its initial opening that it’s hard to imagine the condition the boy’s body was in if he was, indeed, stuffed into this culvert as we saw it. 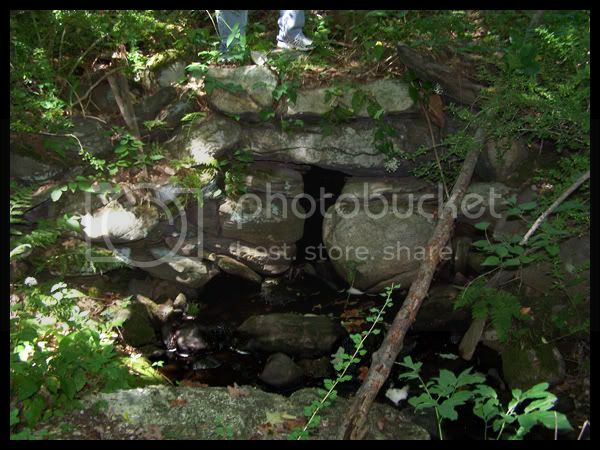 As TJ explained, the culvert’s initial opening is small, but it “opens up” when you look farther inside. It’s a dark hole under a less-than-busy dirt road. I’m doubting many people, if any at all, traveled this route on a regular basis. 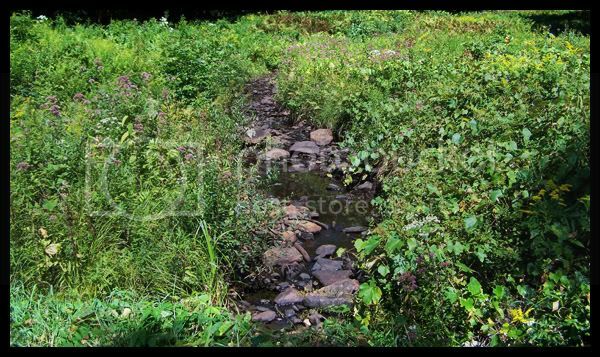 We took notice of the beautiful Kettle Brook, at a few different points, as well as the gloomy and buggy swamp areas that lay beyond the burial ground. 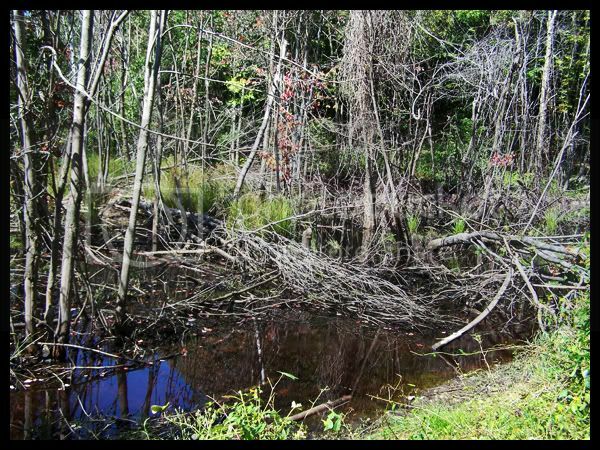 It’s important to note that there are 2 swampy areas, only 1 of which claims the paranormal activity. Spider Gates Cemetery, itself, is not the location much of the paranormal activity in this area is reported. It’s at the bottom of the hill near the swampy area that is a brief walk past the Spider Gates Cemetery. Now, as for the term “the 8th gate to hell” or Spider Gates Cemetery contains “8 gates to hell”, both are preposterous accusations. The cemetery itself has only 1 official entrance and that entrance is enclosed by 3 gates, each of which contain a wrought iron decoration in the center which resemble what many have compared to “the sun’s rays” or “a spider web”. It is a fact that at least one of the gates is a reproduction since the original was stolen, and it is also a fact that that 1 gate does not “equal” 8. I have read many variations of the “8 gates”, my favorite tall-tale version being the one where “the close you get to the 8th, and last gate…” the more apt you are to pass out. And that people have not only passed out when approaching the 8th gate, but there are people who have suffered heart attacks upon reaching the 8th gate, and there has also been the occasional death-upon-reaching-the-8th-gate. The short of it is, it’s all pretty insulting to the community of Quakers this place exists to serve, and to those community members buried within. I was a little warmed by the notion that the official position of the Quakers, concerning these rumors about their cemetery, is that they find it all very humorous. All-in-All the trip to Spider Gates was definitely a wonderful experience. On the way out of the cemetery, as we were wrapping things up and approaching our car, 6 more people in 3 different and unrelated cars, were making their way to parking their various vehicles so they could get a good look, and personally experience Spider Gates for themselves. We were even fortunate enough to meet people who had heard of us from our internet site. What a treat that was! If you’re out there and you’re reading this, thanks for complimenting our site! We were tickled pink, to say the least! Join our forum, let’s chat! 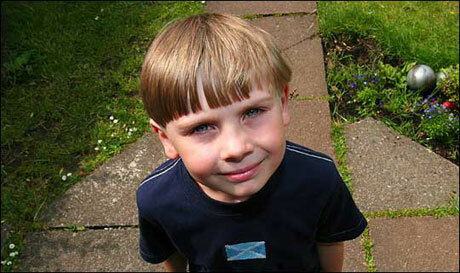 Today's topic is Children who claim to have been reincarnated. If there's one thing that bothers me, on a personal level, it's the thought of children being trapped "in spirit" within this physical plane. If there's one thing that truly intrigues me, it's those stories of children who claim to have been reincarnated, and that they remember their past lives. The mere thought of it sends chills down my back while simultaneously sparking an entirely new level of interest and curiosity. I remember spending a short period of time in the bookstore not too long ago, and becoming so entranced by this random book I happened to pull off the shelf that I actually read through, almost the entire thing, before we left the store. It was fascinating and I highly recommend it. 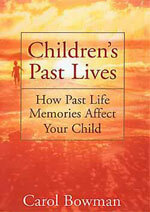 It's called Children's Past Lives and it's written by past life therapist Carol Bowman, a specialist in her field. The book is filled with anecdotes of children who remember, in detail, their lives before they were born into their present one. Sometimes I wonder if everyone has this natural curiosity, as I do, about kids who claim to have memories of a past life. It wasn't too long ago that the thought of reincarnation was considered blasphemy, and still today, by Roman Catholic standards it's considered some degree of sacrilege. The whole concept of "life after death" challenges the modern standard of "science" as the ruling faction of thought and thinking. It's hard to believe that we are taught, and we continue to teach, that the Dark Ages were so far away. That the intellectual problems of the past are not the intellectual problems of our present. Society, as a whole, embraced the Renaissance with open arms and condemned the age of darkness as oppressive and a hindrance to intellectual progression yet, metaphorically speaking, by "tomorrow's" standards we very well may be existing in the same manner of "darkness" in today's day and age. Maybe these children are remembering past lives in ways we can't explain, not just because they have the ability to do so, but because they are proving to us that we are, as human physical beings, are evolving into spiritual creatures with a grasp of life as it exists in a different dimension… a different time… a different space. The whole concept of science, as we know it right now, is being challenged by 4 year olds all over the world. time, die because they fought for science to outweigh the importance of religious faith. And today, we watch as a strikingly similar template is being followed by thousands of people worldwide, maybe more. Children, the most innocent of all people simply because they are ignorant and innocent at the same time. They have no agenda, they have no knowledge or ability to gain such knowledge of spirits they may have contacted, or have had encounters with; or of the historical accuracies of the events, timelines, occurrences, or physical objects they claim to have had experiences with in their "past life", and yet they spill parts of "their" past-life stories with color and flare as though they just had these experiences yesterday. They long for parents and siblings they've never met in this life, and in certain cases, it's been proven that those relatives are still alive. I remember reading one particular care where a boy actually brought a present-day relative to the home of his past-life, and when he explained himself to the residents at this home – who he was in a past life, and what happened to himself, and how he remembered many of the people who were there to hear what he had to say – he was freakishly "right on". This child wasn't even 7 years old yet. because we're understanding and grasping the reality that the spiritual realm has been reaching out to us for longer than we were willing to allow ourselves, and each other, to accept, or believe. And these kids… these reincarnated kids, who throw us into a Buddhist sort of existence, for just a moment if we let them, make us realize that it's not a cliche to say "anything is possible". Anything is possible, and some things step beyond "possible" and make us feel we need to have the confidence that they're actually "probable". If there's one thing I've learned through my years of studying the topic of "the paranormal", it's this; you have your believers, and you have your non-believers. Your typical non-believer, or "skeptic", carries with him/her the uncanny ability to rationalize, normalize, or otherwise "realize" events which may not have an initial, or obvious, explanation. The typical "believer" is more likely to "reason" that "anything is possible" and if they can't find an explanation for what's happening, then it could quite possibly be "paranormal" in origin. There are extreme varieties of both categories and your fanatics come in all flavors. We see people who will never be convinced of anything paranormal, and we see people who believe a grand majority of "the unexplained" can be reasoned as "paranormal" with little more than a 2nd look into an occurrence which lacks an immediate logical basis. I've had personal experiences with both types of personalities, as I'm sure is the case with many of you. As paranormal researchers we find ourselves in a position to represent our chosen field(s) of study. Are we doing this to convert the skeptic? Are we doing this to hush the believer? Are we doing this for ourselves and our own curiosities? Do we find ourselves in a position of being held to a higher standard than thrill seekers and overnight ghost hunting groups? It's a challenge to our sense of why we do what we do, to ask this question of ourselves, honestly. "Why?" 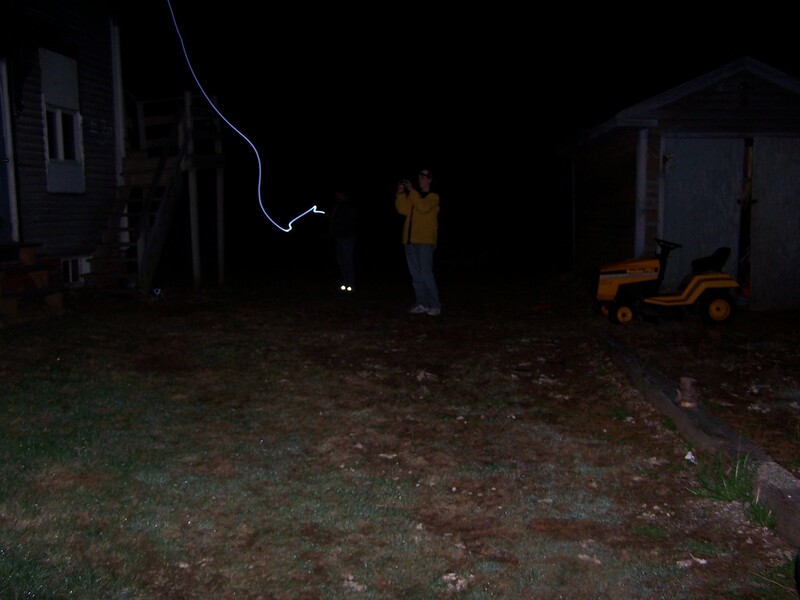 Here's a picture that was taken of 2 Maine Ghost Hunters during an investigation in early 2008. At first glance, it's a fascinating sight to see. 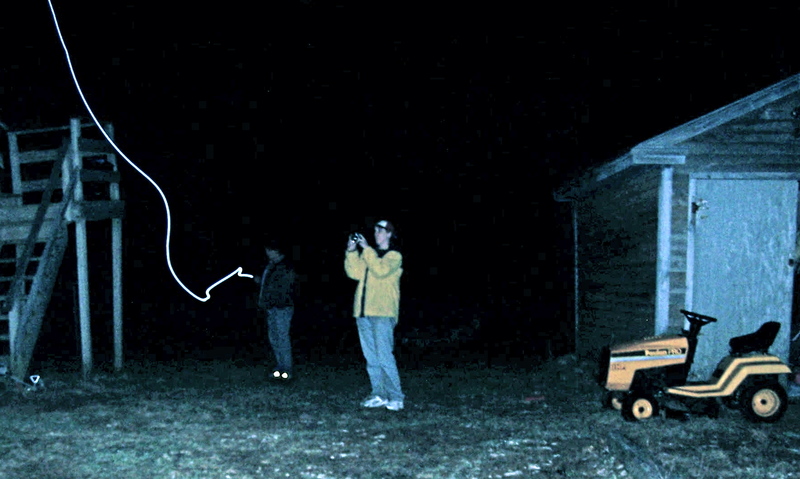 A "light rod" either originating, or ending, into the mid-section of current Maine Ghost Hunter TonyL. Amazing, isn't it? The home we were investigating at the time was a hotbed of activity. We'd heard many stories of strange and unexplainable incidents from the residents, and during our investigation each of us had personal paranormal experiences that, while not harmful, were difficult to pass off as bad wiring, or drafty windows. Surely, those reasons alone were enough to give this fantastic picture a more solid base for us to view as our best piece of evidence yet! I believe, in a moment of excitement, we might actually have been able to use the word "jackpot" when considering what we'd come across with this magnificent light-rod specimen. Hoo-Rah! Am I right? few levels, the most impressive being that the home itself felt very thick with some sort of energy; "be it" true electrical energy due to poor, or old, wiring, or due to some other paranormal source. I'll be honest and say that it wasn't exactly an "inviting" environment to investigate. The people were great, but I perceived the environment to be dismal and oppressive, and I'd been to this home (ironically, having nothing to do with this particular ghost investigation, and having not known this home was haunted when I had previously visited) on a few different occasions. For me, the word "foreboding" could best describe the outside appearance of this home. Given that unshakeable "feeling" of how this house presented itself to me, I was less than thrilled to see this "light rod" entering, or exiting, investigator TonyL. Another, more concrete, reason I was less-than-thrilled was the fact that I had been physically touched (lightly grabbed) by an unseen force during my time inside the home. The incident was chalked up as "par for the course", and isn't something I'm necessarily afraid of, per se. But a force strong enough to physically wrap it's "hand" around a person's arm or leg, and squeeze, is a force not to be taken lightly. The "light rod", under these circumstances, while still fascinating, could also be understood as a type of threat, given its direction appears to be either entering, or exiting, the investigator. 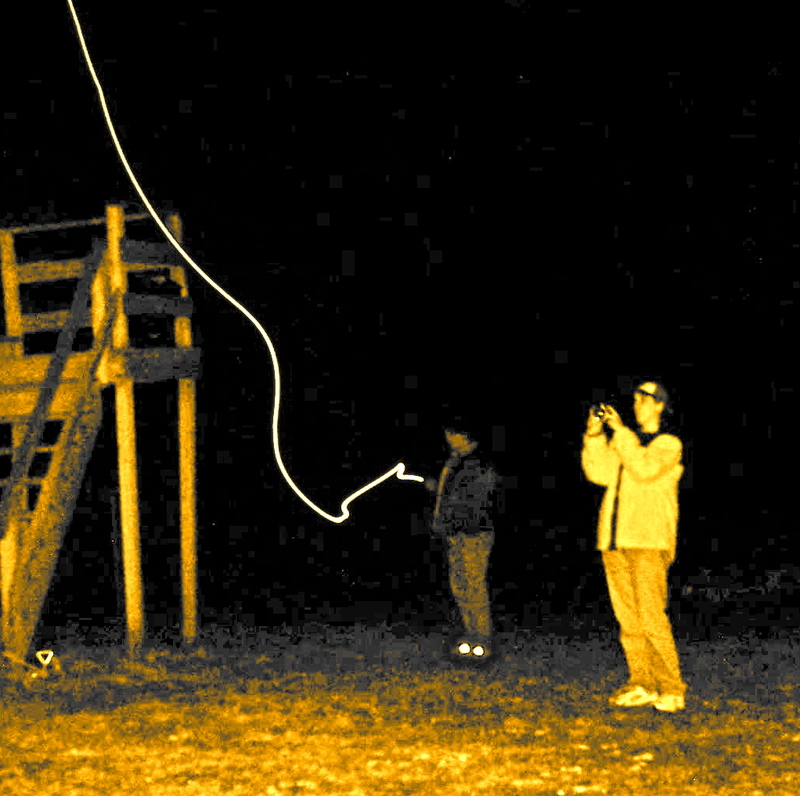 I've seen light rods in pictures from other investigators on the internet and a grand majority of them appear orange, and as squiggle marks smearing across the photo, not entering, exiting, or otherwise appearing to be targeting the people in the pictures. ess I received private e-mails from people who had also been targeted by these same skeptics, letting me know the heavy dose of skepticism I was seeing was not the general consensus of the forum(s) itself. The problem with the skepticism we were witnessing, and trying to discuss through, was that the skeptics were extremists. It seemed I couldn't explain myself thoroughly enough for their understanding. I wasn't looking to prove the photograph authentically paranormal, I was looking for information on how to decipher what was written within the photograph itself. No matter how I presented that question, I was bombarded with accusations of (1) creating a hoax (2) doctoring the photograph with Adobe Photoshop (3) removing the EXIF information manually so the authenticity could not be proven, and the list continued on from there. I even had 1 person send the photo to a "friend" who specializes in scrutinizing doctored photographs, who told me he could "prove" I was presenting a hoax because of pixelation issues within the photograph itself. He went on to explain that the lighting patterns and the pixelation do not occur, naturally, as I had presented in this photograph. My reply was that I didn't doctor the picture, so that left only 2 options. The first was that photograph is, indeed, of a paranormal light source. The 2nd was that his "friend" didn't know what he was talking about. And I voluntarily opened myself up to accepting one of those 2 choices from this not-so-nice skeptic. One of the other, most impressive, responses I received was from a paranormal researcher who had experience with different camera types and lighting conditions. He reviewed all of my EXIF data, thoroughly and with an open mind. He asked me pertinent questions, such as; time of day, lighting conditions, weather conditions, moisture levels, time of year, etc… He made astute observations of the shutter speeds and stability issues related to the camera itself, which allowed me to come to the conclusion that this was most likely nothing more than an extended light streak from an LED light source. Incidentally, all investigators on-scene were certain there was no light source present during the investigation, however, we were wrapping it up and heading home when this picture was taken. It is very possible, and quite probable, that investigator TonyL had turned on his cell phone, which caused the resulting light streak. 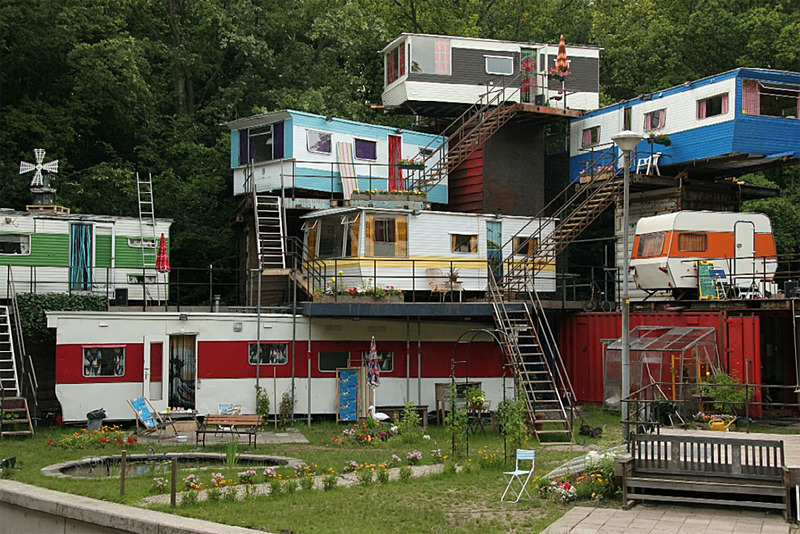 The point of this blog is multi-fold. First, it's aimed at addressing the concept of having an "open mind". When investigators are in a particular environment "investigating", it can be very easy to perceive, even the slightest of odd incidents, to be paranormal. An open mind is something that helps the client as much as the investigative team because in the end, hopefully, both parties are seeking the same end – knowledge through truth. The 2nd point is aimed at the belief structure of the individual, be they an investigator or not, and how that belief system is presented to someone with opposite or opposing viewpoints. An exchange of knowledge is how we become enlightened on subjects of shared interest. Reciprocal respect is not something we should take lightly, and will hopefully be that one thing we have in common when we can't agree on anything else. Waverly Hills Sanatorium. 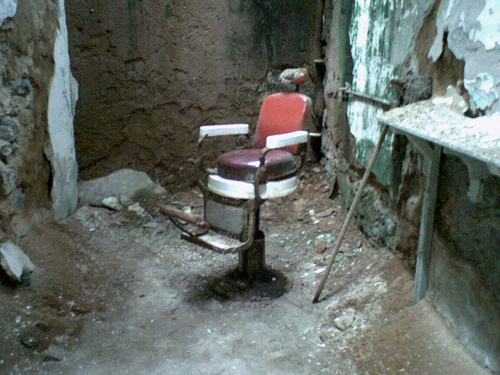 I have to tell ya, I can't wait until we make a trip there; there, and to the Eastern State Penitentiary. 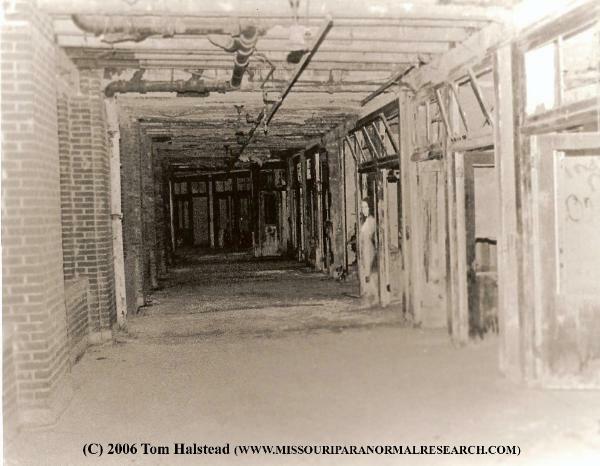 I ran across this Waverly Hills website, not too long ago, where Tom Halstead of the Missouri Paranormal Research group posted quite a few incredibly disturbing spirit photos. 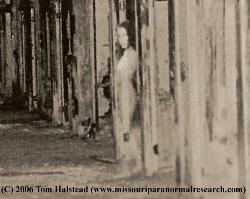 Full bodied apparitions in a few cases, and I'll post those here for you to catch a quick glimpse of. The topic of "haunted places" these days seems to be more of something people talk about when they're looking for a "rush" or a "scare" than they are of places of wonder and curiosity of the human condition. There was a time in this country, and all around the world, when people considered a haunted environment to be a friendly one. Where spirits of past relatives came back to such places as old family homes – homes that stayed in a family for generations – to "check on" still-living relatives. Rarely were there cases of demon possessions or evil hauntings reported, but, with the rise of modern media came the rise of modern "hauntings". 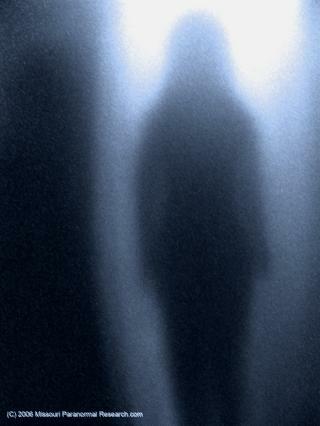 Perhaps they were always there, the demon possessions and evil spirits, and were poorly reported, or perhaps they're simply more prevalent now because, either, media sources have allowed us to become knowledgable of them, or because there are more "beings" presently in spirit form than there ever were before… who knows what the real reasons could be? Pinelands facility in Maine, I think of the people who were condemned to live their last days on earth in such deplorable conditions that their spiritual well-being never fully recovered. People who lived a misunderstood life and who died, often times, forgotten. 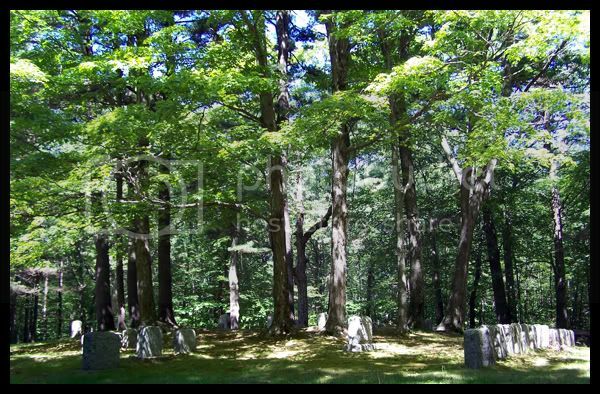 I remember investigating the cemetery out at Pineland (in Maine) and feeling such a sense of grief and depression for those unnamed, forgotten souls who's only mark made in this world was the one left behind with their anonymous "number" carved on their gravestones. They lived anonymously, died alone, and seem to exist in a perpetual state of solitary state of irresolution. I think that's the human connection thrill seekers lack when they walk into the space of a haunted environment looking for that perfect picture or that perfect EVP. The thrill of the hunt supercedes the displacement of energies, which we cause as physical beings, when we put ourselves into the space of a restless soul. We forget how to be human because we forget, lose touch, or have lost touch, with why it is we do what we do – "ghost hunt". Is it to make a connection with the spirit world? Or is it just to prove that spirits exist. Because one of those options shows respect before personal satisfaction, where the other is just self-centered. Waverly Hills represents a dying ground of immense proportion. There's no other way to describe it. No matter how protective the medical staff was, no matter how desperate the situation became, no matter how badly they wanted to succeed, it just wasn't meant to be at the time. People who weren't ready to die, died miserable, long, drawn out deaths which probably resulted from a slow suffocation they could feel invading their airway(s) for … who knows how long. Good people, strong people, kids, adults, teens, rich, poor, innocent and guilty… they all died in the same place and in a similar way. So many, in such large numbers, that no matter what their contribution to society was, they were still a number among numbers. Good people who'd lived Godly lives, who put family above self, watched as their livelyhood – their mothers, fathers, sons and daughters – died before their eyes, before they, themselves, passed from this world scared, alone, and probably a little ticked-off at the unfairness of the whole experience. proof of spiritual life, life-after-death, and in order to do this we must accept the possibility that if, and when, we run into something spiritual in nature, it's roots are deep within the consciousness of the human experience. In other worse, "that's a person without a body". The spirit isn't a thing, it's energy, it's emotion, it's all of those intangible things that make us human. Why this is so easy for some of us Ghost Hunters to forget, is beyond me, personally. well do it up. The Eastern State Penn was designed in good faith with a solid plan for psychological rehabilitation. The model was extremely progressive. Basically, the plan was to build a very large institution with extra thick (2+ feet) concrete walls in a strong effort to recreate the conditions of a super-quiet monastery. This way, the criminals interred there could spend their rehabilitative time focusing on their future successes as responsible and respectful members of society. The entire facility, from its building design to its daily breakdown of structured, rigid routines of exercise times and meal times, was focused on that 1 goal of maintaining a meditative silence which would last 24 hours a day, 7 days a week. Prisoners were not allowed to communicate with each other, or the guards and any attempt at doing so was cause for strict and immediate disciplinary action. The consequences would start with removing the prisoner's only source of light, "the window to God" which was located in the concrete ceiling. This "window" was the only window in the prisoner's rooms, and the only thing keeping them out of complete and total darkness. If removing this light did not work, then the physical torture began. The torture was "by the books", not something the guards or warden made up on the spot, so it was methodical by design and follow through, which meant that all prisoners were subject to similar disciplinary standards, but that didn't make it any less tragic or traumatic. People, by nature, are social creatures. To deny social creatures the inability to socialize is to deny them the right to be human. It is also a means of torture the likes of "no other" because verbal self expression of personal unhappiness falls on deaf ears. There's nothing more tragic for people, or a person, than the feeling of "loneliness"; of being alone in a struggle in life or - as we experience in our paranormal investigations – in death. A person who truly doesn't care about the human experience of others, or of themselves, isn't just a criminal, they are a sociopath. The criminals at the Eastern State Penitentiary may have done "bad" things, they may have done evil things in life, but if there was one thing many of them did not lack, it was a "will" to have that all important human connection. If they didn't care about it, many of them wouldn't still be there today. Whether they're searching for personal resolution, acceptance, or forgiveness… whether they're just looking to be recognized, or looking for a way to take care of unfinished business, the one thing most of them have in common is that they're looking for that "connection". They're still looking for that "human connection", that "social connection". You know a place has to be representative of abhorrent conditions when Charles Dickens, the author of some of the most bleak and depressing novels to hit bookshelves world-wide, tours it and subsequently chastises it as a place so deplorable he never wants to hear its name again. That's the Eastern State Penitentiary; it's a good place gone bad. Gone very, very bad. I guess this posting is really about keeping that in mind. That we ghost hunt, not primarily for ourselves and not primarily for the evidence or the data or the "look what I found!" factor. We do it because we long to make that "connection". We want the rewards that come with the struggle to find that connection, yes; but what we really want is validation that when we reach out, we're reaching out "to" someone. That the someone we're reaching out to is more than a concept, they're real, and they're wanting to reach back and communicate with us, in return. If we didn't do it for those reasons we'd be better off chasing Bigfoot or hunting down UFO's because those "things" have been deemed as "physical", in nature. No, we hunt outwardly because we're constantly hunting "inwardly", and it's a good thing for ghost hunters to keep in mind. Hunt a spirit as you would appreciate being hunted. In all honesty, I think this might apply. I find myself staring at it with a combination of confusion and childlike delight. Naturally, I had to share. Comments welcome, of course.